Love the nickname Coco, but not sure it stands on its own? You’re not alone! The name marries style and an upbeat sound, but what are the best formal names for Coco? 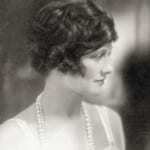 Coco Chanel was born Gabrielle, but in recent years several high profile birth announcements have featured the name. Sonic Youth’s Thurston Moore and Kim Gordon named their daughter Coco Hayley in 1994. More recently, Courteney Cox turned her childhood nickname, based on her initials, into her daughter’s name – Coco Riley. 83 girls were named just Coco in 2015. 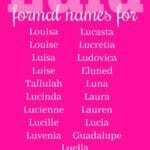 But there are plenty of other possibilities for formal names for Coco. Colette – Originally a feminine form of Nicholas, Colette feels tailored, French, and nickname-proof. But if you were looking for a pet name, Coco might make an obvious choice. Cosette – A Les Mis possibility with the requisite sound. Colleen – Irish favorite Colleen has faded in recent years, but could easily shorten to Coco. 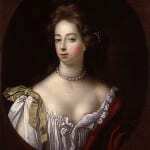 Constance – Underused virtue name Constance comes from a Latin word meaning steadfast. Retiring dated nickname Connie in favor of upbeat Coco might breathe new life into this name. Consuelo – Back in 1877, William Vanderbilt named his daughter Consuelo in honor of her half-Cuban godmother. The heiress’ marriage to the Duke of Marlborough epitomized America’s glittering Golden Age. The name originates with a Spanish title for Mary: Nuestra Señora del Consuelo, Our Lady of Consolation. Consuelo’s repeating ‘o’ makes it one of the most obvious formal names for Coco. Coralie, Coraline – All of the Cora names possess the requisite Co, but the longer ones – like Coralie and Coraline – seem mostly likely to serve as formal names for Coco. 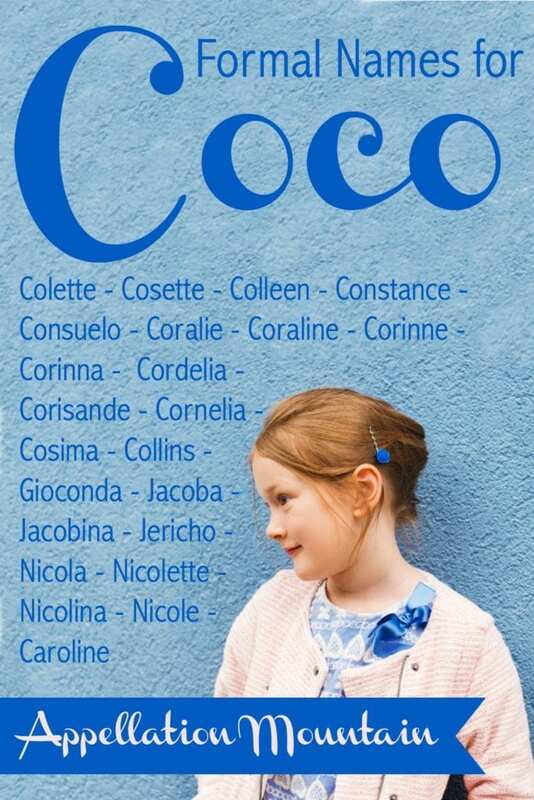 Corinne, Corinna – More Cora names that make sense with Coco. Cordelia – Shakespeare gave this name to Lear’s loyal daughter. Like many a Shakespearean name, the exact origins of Cordelia are obscure. Today, it is a vintage choice enjoying a modest revival. Corisande – Corisande makes for an even rarer literary choice. It might be a cousin to the Coras, or it might comes from corazon, the Spanish word for heart. Corisande first appears in a medieval romance in Spain, enjoyed some brief use in the 1500s, but then faded towards obscurity. Cornelia – Cordelia and Cornelia are separated by just one letter. But while -delia feels stylish, -nelia remains in fashion limbo. Maybe it’s the threat of nickname Corny, but really, why would that ever come up when Coco is an option? Cosima – Cosima ought to be taking off right about now. Claudia Schiffer and Sofia Coppola both gave the name to daughters in 2010. Celebrity chef Nigella Lawson’s daughter, Cosima – known as Mimi – appears in the public eye occasionally, too. The Cosmo cousin feels spacey, European, and quite stylish. But the name has never cracked the US Top 1000! The Co makes this rarity a natural for the list of formal names for Coco. Collins – Surname name Collins first gained attention from 2009 movie The Blind Side. (It’s the teenaged daughter’s name.) Colin has become a modern staple for a son, but Collins tends to be used more for girls – opening the door for nickname Coco. Gioconda – Giocanda serves as another name for da Vinci’s masterwork Mona Lisa. It simply means “joyful” in Italian. With Giovanna on the rise, could Gioconda wear well in the US? Gia might be the natural nickname, but there’s a definite ‘co’ sound in there, too. Jacoba, Jacobina – Long-time favorite Jacob never inspired a feminine spin-off, but Jacoba and Jacobina have potential. Cobie Smulders answers to Jacoba, but the actress could just as easily opt for Coco. Jericho – This Biblical place name trends masculine, but it also provides a direct route to Coco. Nicola, Nicole, Nicolina, Nicolette – All of the feminine forms of Nicholas serve as formal names for Coco. Since Nikki/Nicky/Nickie seems like a mom name nowadays, Coco makes a great alternative. Caroline – Classic Caroline doesn’t obviously belong with formal names for Coco. But there is a C and an o – separated by an ar, of course. Still, we tend to accept a broader range of nicknames attached to the truly traditional names, so Caroline “Coco” would work. Almost any C.C. combination – Colette Clementina. Catherine Collins. Colleen Cassidy. While we might except the initials C.C. to lead to Cece as a nickname, it’s perfectly possible to end up with Coco instead. Do you think Coco needs a formal name? What are your favorite formal names for Coco? Are there any I’ve forgotten? 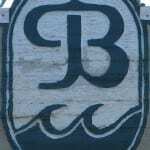 This post was originally published on November 17, 2011. It was substantially revised and re-posted on August 10, 2016. You forgot Courtney and Corey …. I met the cutest little girl named Coral at Disney World who’s parents sometimes called her by the nickname Coco. Cosima (Coco) was one of my top name picks if my child was a girl. I’m surprised it hasn’t become more popular! It’s also the name of a character on Orphan Black, although she pronounces it CoSEEma. We have a daughter Charlotte who is seven, and her nickname is Coco…. 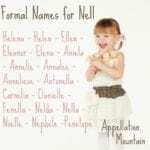 when friends and relatives started giving her nicknames we didn’t like, such as Char and Charlie, we took matters into our own hands and gave her a child friendly nickname we did like! We think the C and O in both names links them well enough…. Coco is the nickname of our son Cove. A friend of mine is using Coco as a nn for her daughter, Chiara, too! I’m surprised no one has mentioned Courtney as a way to get to Coco. I know three Courtneys and they all answered to Coco at one point in their lives. Also, who said you had to give your child a nickname based solely off their actual name? I have two great-uncles whose names aren’t related to their NNs at all. Delbert Lowell was always called Bud and Johnny Donald was always called Bill. I love it and think it’s cool. My french friend told me that my nickname in France would most likely be Coco as most Cocos originate from Corinne (1 r 2 ns). My little brother who is named Connor is sometimes nicknamed Coco by my aunt. Coco’s nice, but I much prefer the longer forms to the short one. I think it could work on just about any “C” name, really. I rather like Rococo as a wild card option. How about Columbine as another (slightly) less individual option? Rococo – daring! And Columbine is lovely, except I think in the US it is still linked to the tragedies in Colorado, rather than the flower. I love Columba for a girl, since Columbine is a bit ‘attached’. I’ve always been fond of Jacoba. I don’t understand why it isn’t more popular! I have the clown association as well. I think I’d find it hard to take seriously an adult who went by the nickname Coco. Incidentally, model Coco Rocha’s real name is Mikhaila. While I know several pets with the name, the only Coco I know in real life is actually named Hershel. My cousin Corey’s family nickname is Coco. Her niece and nephew called her Coco when they were babies learning to talk, and we all adopted it. My name is Nicole. Most of my family calls me Nikki but my mom has always called me Coco! I actually have a friend with a little girl, Khloey, they call her Koko for short. Could definitely apply to the Chloe’s out there as well. Also, Cokie Roberts nn stems from Corrine, one of her many given names. If Corrine can get you Cokie, I think it could also get you to Coco. Corisande is so beautiful, but I don’t know if I would use the nn Coco. Socorro could use Coco as a nickname. I LOVE the name Cordelia, though I prefer the nn used by Joss Whedon on Buffy/Angel…Cordy! I think Corisande is beautiful. I worked with a non-hispanic Consuela though surprisingly everyone called her Kiki not Coco. […] of, and I’ll admit that it strikes me as wonderfully weird. […] weeks ago, Fetching Names looked at Coco, a spirited short form of … what, exactly?